Sub-grade: Native soil underneath a road. 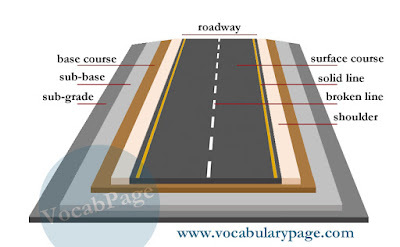 Base (also base course): Layer of material under the surface course. Surface (also surface course): The upper layer of the road. The surface can consist of asphalt, concrete, cobblestones, tiles or earth materials. Asphalt and concrete are the most common surface materials. Asphalt: Black or brown sticky substance, mixed with crushed stone, sand or gravel, which is used for construction of road surfaces. Concrete: Building material created by mixing together cement, sand, gravel and water. Cobblestone: Rounded stone used to make the surfaces of roads. Tile: Concrete or baked clay of various shapes and colors, used for covering walls, roofs or surfaces. Earth materials: Soil, sand, gravel or granular products. Gutter: Channel at the side of a road to collect rainwater and carry it away from the roadway. Ditch: Long hole dug at the side of a road to channel water. Culvert: Tunnel that channels water under the roadway from one side to the other. Yellow lines: Lane of traffic moving in opposite directions. White lines: Lane of traffic moving in the same direction. Broken lines: Safe to cross the line if the way is clear. Grader: Vehicle with a long blade used for grading surface. Roller: Heavy vehicle used to make surface flat by compacting soil, gravel, asphalt, or concrete. Paver: Vehicle used to lay asphalt or concrete on surface. Culverts help control water flow. The ditches play important roles in agriculture. Graders are often used to remove snow. Cobblestones date back to ancient times.